Seat the patient comfortably and support the injured part. Always stand in front of the patient. Apply the bandage evenly and firmly. 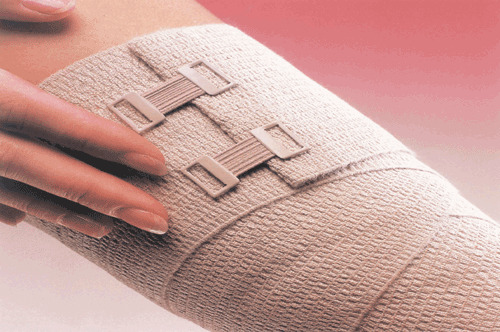 Too tight a bandage will restrict the patient’s circulation and one that is too loose will fall off. A wound or injury should be rested. If the patient is in bed, support the arm or leg on a pillow; if he is up support the arm in a sling and the leg on a stool. Hold the bandage with the roll uppermost. Commence with a firm fixing turn. Apply it from inside outwards and from below upwards. Use a firm, even pressure for every turn. With each turn cover two-thirds of the previous one. Avoid covering the tips of fingers and toes, if possible. Fasten off the bandage with a small safety 1 pin or bandage clip. Place a pad of cotton wool under the bandage where any two skin surfaces can rub together, for instance under the armpit. This is to prevent friction and soreness. With the roll uppermost and rolling it from the inside outwards, secure the end with a firm turn below the injury or dressing. Work up the limb making spiral turns with the bandage. Cover two-thirds of the previous turn with the next. Keep an even Pressure on the bandage. This pattern of bandage is suitable for awkward joints such as the ankle. Support the foot before you start. Working from the inside outwards, make one straight turn around the ankle first. Take the bandage across the top of the foot from the inside of the ankle to the little toe, take it under the foot and up by the toe joint. Bring the bandage across the foot to the little toe and make a turn underneath to bring it up by the joint of the big toe again. Take the bandage back up across the top of the foot and round behind the ankle. Continue figure-of-eight turns until the whole foot is covered. Finish with a straight turn around the ankle and secure the end. Check the patient’s foot after a short delay and re-apply the bandage if the toes become cold or blue.